President Trump speaking during the CPAC 2019 conference. “Essentially there’s no inflation,” Trump said. “Can you imagine if we left interest rates where they were, if we didn’t do quantitative tightening. Taking money out of the market if we didn’t do quantitative talk, and this would lead to a little bit lower dollar,” he said. Fed officials kept their target range for the federal funds rate on hold, at 2.25 percent to 2.5 percent, when they met in late January. They’ll gather again in Washington March 19-20, when most economists and investors expect they’ll again leave rates unchanged. Powell this week repeated the Fed’s recent mantra of being “patient” on future rate moves. Trump in late 2018 repeatedly castigated Powell and the central bank for the series of rate increases made from record low levels achieved during the severe recession a decade ago. “The only problem our economy has is the Fed,” Trump tweeted on Dec. 24. A few days before that, Bloomberg reported that Trump had discussed firing Powell, his pick to lead the Fed, out of frustration with the string of rate increases. Since then, though, Trump and Powell discussed the economy over a steak dinner in early February, and Trump’s criticism subsided -- especially after the Fed emphasized a more patient approach. The Federal Open Market Committee in January termed inflation pressures “muted,” a key reason to go slow on future rate increases. The Trump-Powell dinner was characterized at the time as casual and productive by Treasury Secretary Steven Mnuchin, who was also present, and monetary policy wasn’t discussed. Mnuchin said another get-together may happen. 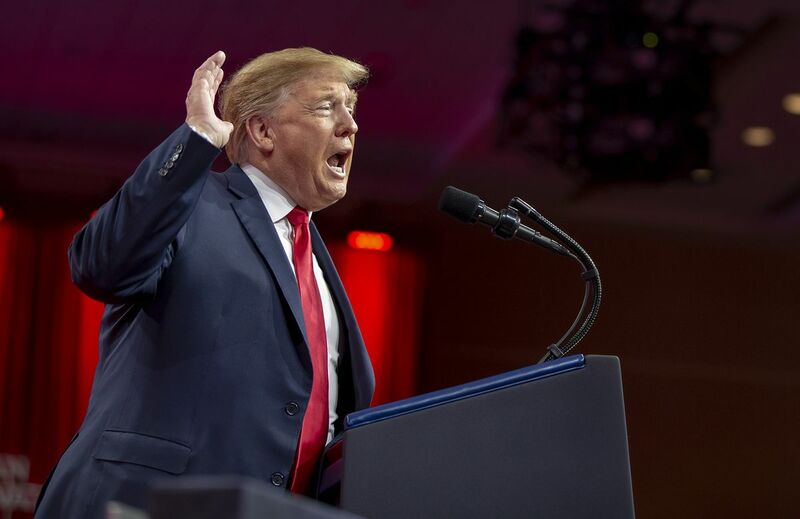 Saturday’s return to the topic of the Fed by Trump came during a more than two-hour speech in which the president touched on an array of long-standing grievances.